Birthday Party We have a variety of packages to meet any budget. Let us do all of the work while you enjoy the party. Space is limited, so reserve your date today! Play Laser Tag Open during any public roller skating session and select league days. Also great for any birthday party or special event! Stay up to date on all of our fun events and activities, and receive special discounts and coupons direct to your inbox! How do I reserve the rink for a birthday party? You can reserve a date online using the button at right or by calling us at (402) 562-5663. Ready to register for one of our sports leagues? Register online today, stop by the Event Center, or sign up by phone at (402) 562-5663. Hang out with your friends. Bring the whole family. Listen to the latest in hit music. Our public skate sessions are lots of fun and good for your health. Stop out on Fridays for "Kids Night", or hit up our "Family Night" on Saturdays. Take advantage of our special Family Rate, where the entire family can skate for just $10 (rentals extra). Navigate your way through a maze of glowing columns for a high-tech game of tag with friends and family. With a variety of themed games available, no two games are ever the same. Also, be sure to check our redemption arcade. Use tickets won from our games to redeem for prizes at the redemption counter. Columbus Event Center is a growing indoor sports complex that currently offers indoor soccer, roller hockey, and dodgeball leagues. As we continue to work on a new location, be watching for new sports options to become available! Columbus Event Center is home to a wide variety of fun events and activities for you to enjoy...Food, Sports, and Fun all in One! 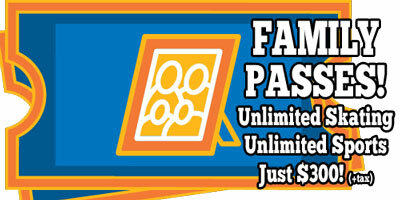 Buy a Season Pass Today!